The computer gives us a model to describe the workings of our body and brain. Current graphic software, used to create pictures and images, gives us a model to describe society. I refer to the idea of “layers”, whereby an image is built or manipulated by superimposing several individual layers, each containing a particular detail or modification. In the final image, the layers are invisible, but without them, it could not be constructed. Extending the analogy to society, the layers correspond to the threads of reasoning on which truth is suspended, easily missed by the common eye, especially when the controlling establishment secures their hiding. Given the countrywide protests against recent police-killings of African-American, unarmed victims, (notably in Ferguson, Missouri and in New York), the “layering” approach may serve the purpose – by detaching the details, to make sense of the whole. For US readers, some of the following information may sound like an annoying bell, given the repetitive reenactments and recount of the events by the corporate media. But I read the transcripts of the grand-jury session in Ferguson, which cleared the shooting policeman of wrongdoings. In particular, the testimony of “Witness #10” who, incidentally, is African-American. The verdict of the grand-jury triggered protests and riots. This analysis will target the essentials. The thesis, if any, is that these protests are useless – they are much ado about nothing. Not because of the protests, but of their misdirection. A policeman on patrol in Ferguson, Missouri, sees two youngsters walking in the middle of the road and tells them to move to the sidewalks. There are nationwide ordnances on the matter. I know people who have been fined for crossing a street outside of the pedestrian stripes. In itself, this request or admonition was necessary and reasonable. The youngsters refuse to obey, whereby the policeman puts the car in reverse, until he can talk to them. The huskier of the two reaches through the car window and engages the officer in a confrontation, hits him on the face and attempts to reach for his gun. DNA from the victim confirms this, as does, in part, the testimony. After a short struggle, the youngster leaves and reaches a sidewalk. The policeman exits the car and orders him to stop and lay on the ground. He refuses and advances towards the officer, who shoots and kills him. The victim’s refusal to obey the policeman’s second order is incomprehensible – were it not, perhaps, that, minutes before, he had conducted a robbery-assault at a convenience store to steal two packets of cigarillos. The robbery, caught on video (link at the end of this article) is instructive. Look at how the robber shoves off and threatens the store-clerk who demands payment. After the shooting, the victim is left on the ground for hours, in the middle of the road, visible to all. A cadaver, uncollected in the street, silent symbol of irrelevance, of contempt, a road-kill, a victim, no-better-than-an-animal. Without separating the beginning from the end of the tragedy, the subsequent events (including the protests), compound each other into a chaos of misinformation, distorted reality as a claim for justice, and assignation of the wrong cause to the real problem. To attribute guilt to the Ferguson policeman and, through him, to racism is convenient, because color we see, structural injustice we don’t. Racism helps hide and obscure that the event(s) are the fruit of a system, – a system the policemen guard, while acting as targets of the public’s wrath. The Ferguson’s victim had no hands in the air. 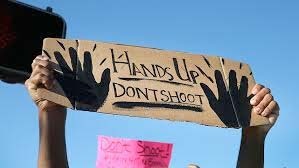 Therefore the nationwide chants and slogan, “Hands up – don’t shoot” lose their credibility even before they are chanted. In no way this is a defense of the police. I don’t know why, but I find the police in Europe inherently less intimidating than in America. Not long ago, while driving in Northern Italy, along a solitary and secondary road, I was stopped by the police. I was pretty sure to have done nothing wrong, but maybe I had missed something. After a thorough analysis of my driving license and the rented-car documents the officer asked me why I was driving on that road. I said I had one free day before returning home, and wanted to visit an area of Piedmont that was new to me. Whereupon the policeman transformed himself into a veritable touring guide, telling me where to go in the next town, what good restaurants there were, asking what type of food I liked etc. Truly, had there been a bar nearby, I would have asked him in for a coffee. There are, of course, very many polite police officers all over the country, but whereas in Europe police shootouts are rare, in the US they are routine. The very presence of a police car, in the collective mind, suggests fear, intimidation, crime, punishment, guns, gun battles and the citizen’s ultimate defenselessness. And while policemen must protect themselves as best as they can, the bulkiness of the added gear contributes to the perception that the police is omnipotent and certainly not what the word suggests. The original Greek word is “polis”, that is, city, with “police” meaning administration and safeguard of the city’s wellbeing. Compound the protective gear with the full militarization of their equipment. And the SWAT teams, human Ninja turtles, raiding (and occasionally mistaking the address), bursting into homes by smashing doors, machine-guns drawn or shooting, searching for pots of marijuana. The growing and selling of which is, for most, but a desperate attempt to escape from poverty. What causes an 18-year old, post-humously praised as a “good kid”, who “looked forward to college” etc. to rob a convenience store, in an act of defiance (or arguably so, based on the testimony of his friend)? Most of us have done silly things in their teens, including this writer. But in the thousand Fergusons, for many youngsters (and adults), life has already sunk into a tedious uniformity, and, seemingly, it allows no hopes but those of robbing and not being robbed. A point not lost by the mainstream media and the neo-cons, as statistics show that the majority of black victims are victims of other blacks. And that the police kills more whites than blacks, though African-Americans are proportionally higher in number. But in the peripheries rage, fear and diffidence blossom into a war amongst the poor and police appears as the most visible enemy. Which brings us to the even more uncalled-for strangulation of Eric Garner, a 45-year old African-American New-Yorker, guilty of illegally selling cigarettes one-by-one (called “loosies” in the almost romantic lingo of the underground). What causes a father of six to be reduced to sell loosies as a kind of profession? The ceremonial masters of the protesters have not and will not ask these questions. Rather, along with Obama and his acolytes, they have shifted the issue from class struggle to identity politics, with chanted masses of paraded dismay and frankly grotesque. Especially chanted by their two most prominent multi-millionaire officiants. One is the President’s ambulating right-hand for identity issues, the Rev Al Sharpton, who began his career as a cocaine dealer turned FBI informant, and whose reverendness consists of the added title. He knows how to intone the black sound, and say words that mean little but prompt applause, while adding extra cash to his pockets, thanks to the corporate media’s TV interviews – another luminous example of disaster capitalism. The other is Rev. Jessie Jackson, a little less scarred by his background, but whose chants echo Sharpton’s. Eric Garner’s tragic end points to the gargantuan disproportion between crime and punishment when comparing classes. Less than 2 miles south from where he was killed, work and prosper the swinging swindlers of Wall Street, whose financial crimes an Eric Garner could not equal in a thousand years of selling “loosies”. Garner died, the Wall Street swindlers rather than prosecuted, were handsomely rewarded with millions, for being “too big to jail.” Shakespeare would say that “description cannot suit itself in words, to demonstrate” the depth of this injustice (1). The widow of the victim herself, Esaw Garner, stated that the problem is not race. But Obama proposed to have “a conversation about race”. An initiative that, in spirit and scope, compares with arbitrarily designating a day of the month as “National Kumquat Day”. Besides, the hypothetical and elusive “growth”, a favorite recipe and promise by politicians to address social problems, is flawed at the start. The very concept of growth is totally different from the concept of progress. It is an ideological concretion to trick the populace into doing the bidding of the 1%. While a proper motto for the enforcers of the system, the police, may be, “A staff is quickly found to beat a dog”(2). Where the metaphorical dog, in the instance, is the 99%, colored or otherwise. In the play. A citizen explains to other citizens the rationale for getting rid of Coriolanus, perceived as an emblem of the ruling and exploiting class. This entry was posted in After Dinner Quotes, Historical Quotes, Philosophical, Psychological & Historical Considerations, Presentation Ideas, Shakespeare and Politics, Shakespeare on Mass Psychology and Group Behavior and tagged After Dinner Quotes, coriolanus, great quotes, tips for presentations. Bookmark the permalink.